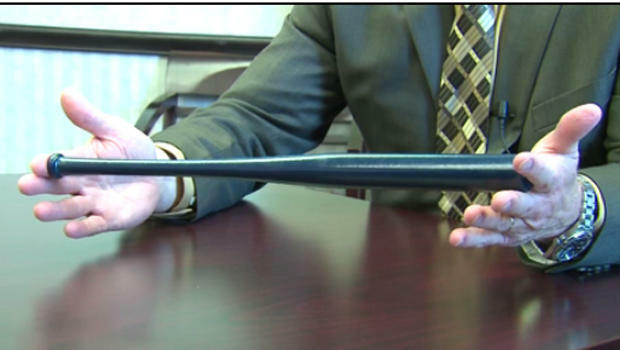 In the wake of the school shooting in Parkland, Florida, a school district in a suburb of the northwest Pennsylvania city of Erie is arming its 500 teachers with baseball bats, reports CBS Erie affiliate WSEE-TV. "It is the last resort," said Millcreek Schools Superintendent William Hall, "but it is an option and something we want people to be aware of." According to Hall, the 16-inch bats were distributed to each teacher following an in-service training day on how to respond to school shootings. "We passed them out, with the goal being we wanted every room to have one of these," said Hall. "Unfortunately, we're in a day and age where one might need to use them to protect ourselves and our kids." Hall says the bats are primarily "symbolic", but are now an option for teachers to use, should they need to fight back in a school shooting. Millcreek Education Association president Jon Cacchione says he supports the decision to arm teachers with bats, which will be locked up in each classroom. "This is a tool to have in the event we have nothing else," said Cacchione. "Part of the formula now is to fight back, and so I think the bats that were provided for the staff were symbolic of that." Hall says it's just one of several initiatives in the works to ensure student safety, including a concrete barrier around the high school walkway and additional security measures at each entrance. The district also conducted an online survey to see if the public supports the idea of arming select staff members with guns, if it becomes legal in Pennsylvania. "We thought just putting that one question out there would give us an idea how the community felt,"said Hall. "It was about 70 percent to 30 percent that people would favor that, but we're not really actively planning that right now."